Many hog raisers in the country are complaining that piggeries are no longer profitable businesses because of the high cost of feeds. One fellow, however, is not complaining. He produces his own fermented feeds at a low cost and says there is big profit in hog raising—if you raise them the organic way. The fellow is Jess Domingo, a former top executive of a big corporation, who runs the Domingo Ranch in Alfonso Lista, Ifugao. Jess opted to retire in 2004 from a corporate giant as a financial officer after reaching the age of 50 so he could indulge in his passion for farming and culinary art. Brahmans. His culinary school was profitable, but it required a lot of his time, so he did not have enough time to attend to his cattle. time to give up the culinary school and devote his full energies and time to farming. 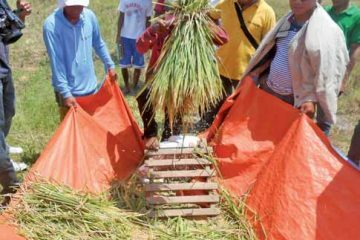 TURNING POINT – In 2011, he decided to attend a seminar on organic farming offered by Ronald Costales, who has a prizewinning organic farm in Majayjay, Laguna. His main intention then was to look for a good forage crop for his cattle. After attending the seminar, however, he was no longer interested in looking for a good forage crop. He was more interested in the idea of organic farming, and so he set aside a five-hectare area for organic farming in his farm. greens, which are too delicate to transport over long distances. So he decided to raise pigs in the organic way that he learned from Costales. Jess Domingo’s mother pig. It costs him only 675 to produce one wean ling for fattening. 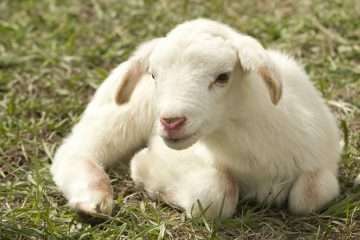 If sourced outside, one wean ling will cost him 2,500. 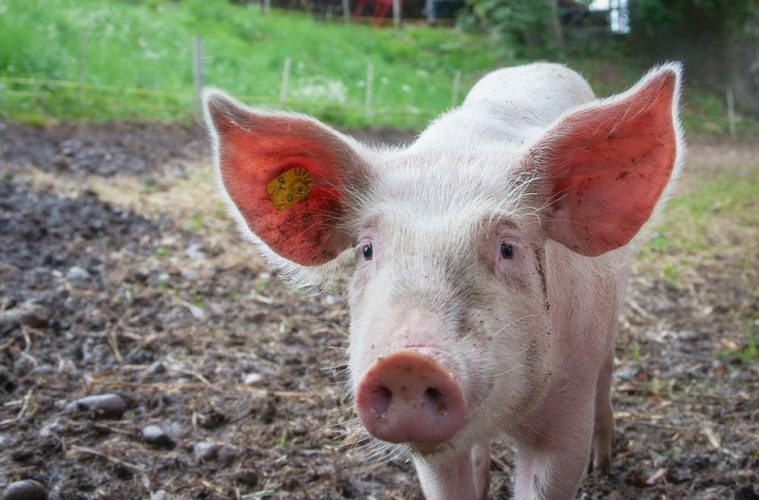 RIGHT PROJECT – Raising organic pigs was the right project for him for one very good reason. Pork is expensive in Isabela, his target market, which is just right across the border of his province. 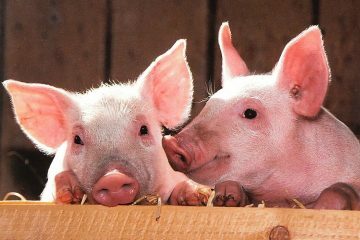 At the time of our interview (April 6), he said the going price for pork was 125 per kilo live weight. 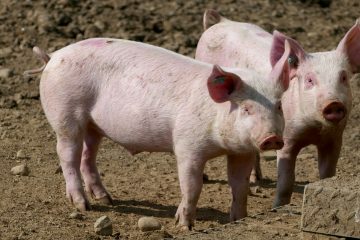 He has also found that producing pork the organic way is very profitable, even if there is no premium for such pork in his target market. the cost of the piglet, labor, water, and utilities. Because he produces his own wean lings, the cost per head is only 675 compared to 2,500 when sourced from outside farms. Jess places the total cost of producing a 90-kilo fattened hog in a period of 5.5-6 months at 5,375. This is broken down to 3,500 for feeds, 675 for the wean ling, 500 for labor, and 700 for water and electricity. He currently sells his 90-kilo hogs at 125 per kilo, so he gets 11,250 per hog. That means a profit of 5,875 per head. That’s more than the cost of production. CHEAP FEEDS – How come his feeds cost only 9.50 per kilo while the conventional commercial feed in the market is 28 per kilo? He has very cheap ingredients. In one batch of feeds for his fatteners, he uses 50 kilos of D1 (fine) rice bran that costs 9 per kilo; 5 kg soya at 32 per kilo; 7 kg copra at 12 per kilo; 15 kg water hyacinth (better known here as water lily) which he collects from his own pond; 0.5 kg salt; and 0.5 kg lime. To these he adds plant extracts (sambong and lagundi). The mixture is then fermented inside tightly covered plastic drums for 15 days before use in feeding. 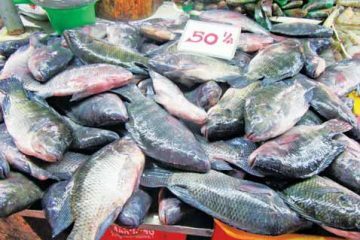 The cost per kilo comes out to 9.50. 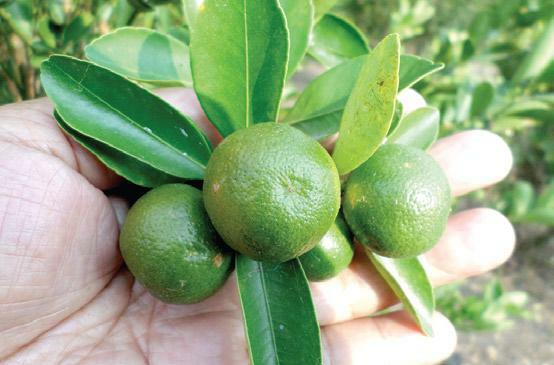 Chicken manure makes the calamansi fruitful. NO FOUL ODOR – Jess Domingo’s piggery does not have the usual foul odor found in conventional piggeries. 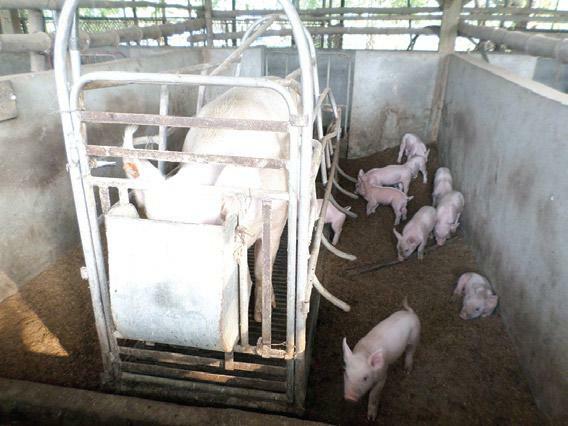 Instead of cemented flooring, the flooring in Domingo’s piggery is onemeter deep rice hull. The pigs are not bathed at all but they are clean. The piggery does not have a foul smell because it is regularly sprayed with an EM (effective microorganisms) activated solution which is cheap. 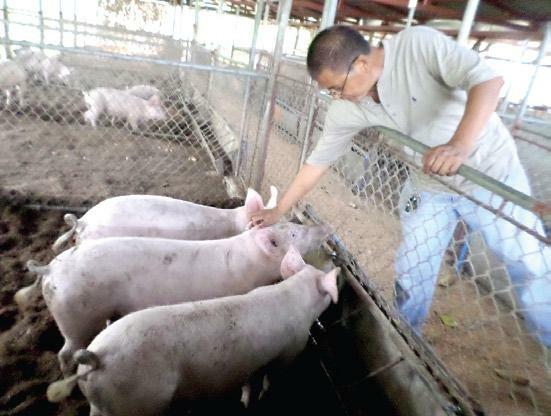 TRAINING FARMERS – Because the provincial agriculturist in Ifugao has requested him to do so, Jess has been conducting seminars on organic pig production for farmers and entrepreneurs. The problem of most farmers, he has observed, is that they don’t have access to some of the ingredients like soya and copra in formulating their own feeds. Jess thinks that if the farmers only have access to ready-mixed fermented feeds, more would go into organic pork production. And that is the reason why he is thinking of putting up a feed mill for this purpose. Costales has a model for that which he can copy. FREE-RANGE CHICKEN – Jess also has free-range chickens. At first, he raised chickens for meat. However, the market was a problem for broilers in his place. 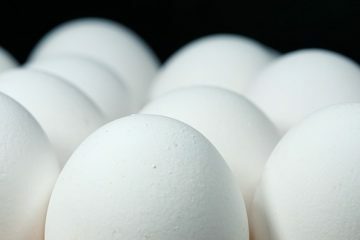 There is, however, a market for organic eggs, and that is why he is concentrating on it now. He has enclosed his 40 calamansi trees for the chickens. They don’t only provide eggs for Jess to sell at 8 to 10 per piece. They also make the calamansi trees healthy and fruitful because of their manure. 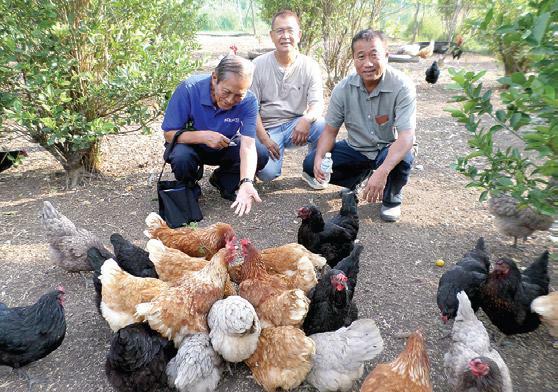 COSTALES TO HELP IN MARKETING – Ronald Costales, who has established a growing clientele for organic farm produce, is encouraging Jess to produce more organic pork and eggs. He said he can market Jess’ pork and eggs in Manila. Another product that one of Ronald’s customers is looking for is grass-fed beef. Maybe this can be another project for Jess to undertake. Jess has 95 Brahman cattle, but they were not grown the organic way. They are still medicated with conventional drugs whenever there is a problem. Jess Domingo’s free-range layers are very tame. Here they feel at home with ZBS, Ronald Costales, and Jess Domingo behind them. Anyway, it should not be difficult for Jess to go into organic beef production. OTHER PROJECTS – Jess also grows other crops. He already has a lot of mango trees scattered in his ranch. He just finished harvesting the last fruits of his organic papayas before our visit. And he is going to plant a new crop. He also has demonstrations of tomatoes and hot peppers for his trainees to see. Oh yes, he conducts seminars, not only on organic pigs, as part of his outreach program. He has a greenhouse to demonstrate the difference in the performance of crops grown inside and outside a greenhouse. He has a vermi-composting operation to produce organic fertilizer for his crops. He uses his cattle manure as the main material for making vermi-compost. JESS THE CHEF – We will not forget the sizzling bulalo he served us for lunch during our visit. It was so soft, tender, and tasty, you only needed your fork to eat it. He also concocted fruit juices for us—Ronald and Josephine Costales and myself. To make his special ‘turon’, he quartered each saba banana fruit and wrapped 2 pieces to make one ‘turon’. They are the size of most shanghai lumpia and are very convenient to eat. Jess also gave us some ideas on what is taught in a culinary school. He said it is not a matter of going through recipes. One should consider cooking as a concept and it is up to the creative chef to come up with his own special culinary concoctions. There are tricks to capture certain flavors of ingredients, for instance. Well, that belongs to another story. How do we get in touch with Mr. Jessie Domingo if we want to learn about his farming methods?